Softtrends Marketing Connector is an add-on that synchronizes data between your marketing environment (such as Salesforce Marketing Cloud) and either a Postgres database or a Kafka topic. You can use Marketing Connector with all applicable languages and frameworks supported by Heroku. If you are just getting started with Heroku or Heroku add-ons, please see the Heroku Getting Started Guides or the add-ons overview. 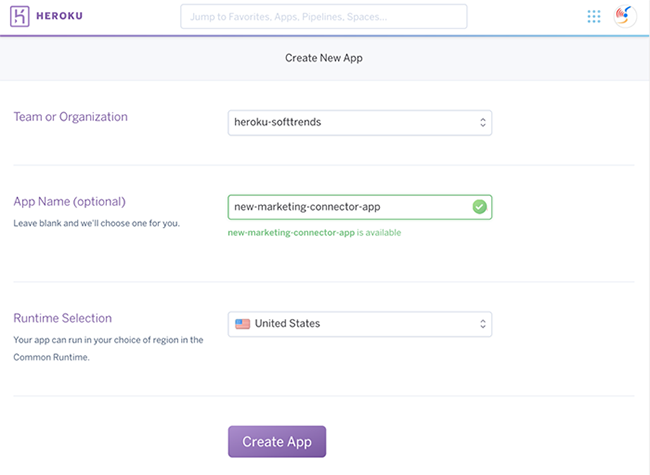 If you don’t already have a Heroku app that you want to use with Marketing Connector, you can click this Heroku button to create a new app that automatically includes Marketing Connector and all necessary dependencies. Steps for creating the app manually are described below. Ensure your marketing environment is properly configured to allow API access from external applications. If you are using Salesforce Marketing Cloud, see this article for guidance on configuring it properly. 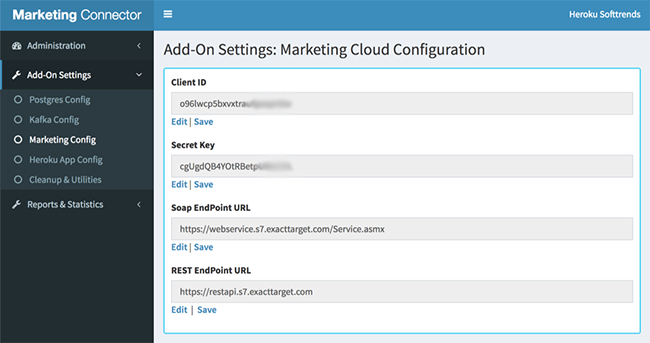 Marketing Connector can only be used with Salesforce Marketing Cloud editions that have API access enabled. Some plan types, including trial versions, do not have API access by default and cannot be used with Marketing Connector. Have your Postgres and/or Kafka instance information ready to provide configuration details to Mareting Connector. Marketing Connector requires that your app has a Postgres database and/or Kafka topic available to sync and/or publish data. Full instructions for configuring Marketing Connector are described in Navigating the add-on dashboard. Marketing Connector supports all standard, premium, and private Heroku Postgres plan types. 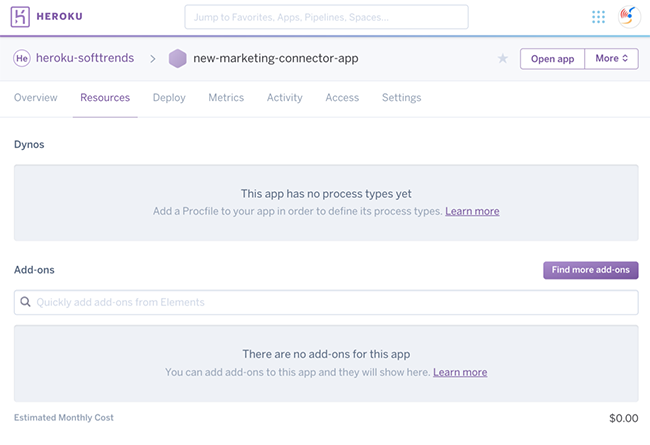 Marketing Connector can be used to sync data between a Salesforce Marketing Cloud instance and a Heroku Postgres database that is inside or outside a Heroku Private Space. Although it is possible to use Marketing Connector with a hobby-tier Postgres database, it is strongly recommended that you use a standard-tier or premium-tier database. 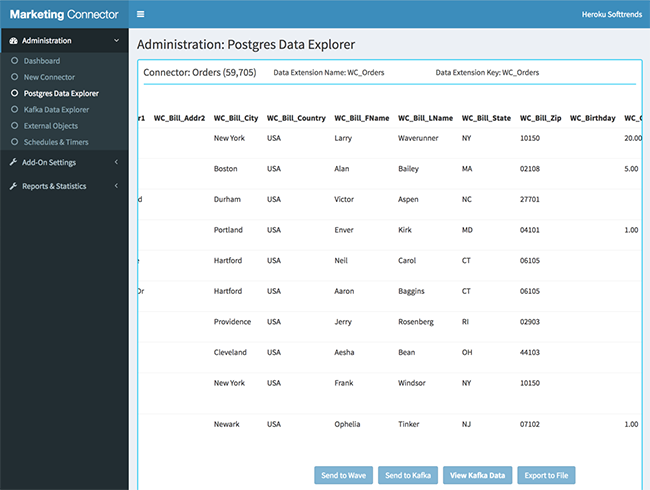 Hobby-tier databases have limited row and connection counts that can be consumed quickly if you configure multiple marketing data connectors in the add-on. 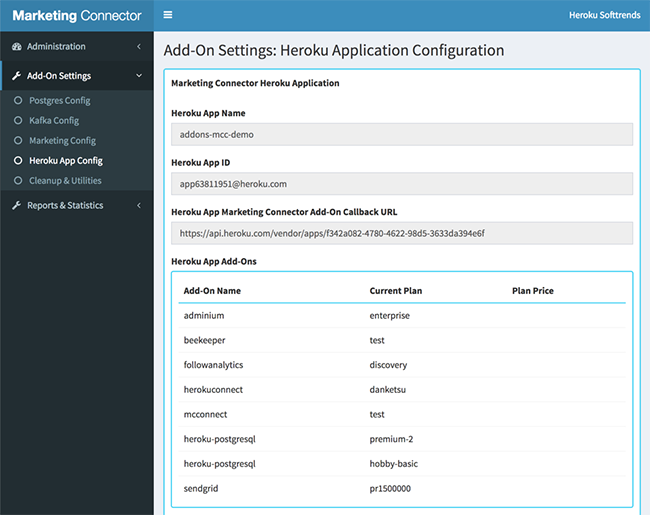 Marketing Connector supports all standard, private, and extended Heroku Kafka plan types. 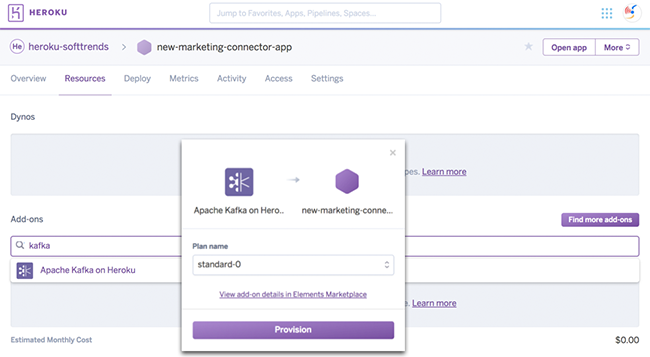 Marketing Connector can be used to sync data extensions between a Salesforce Marketing Cloud instance and a Heroku Kafka Topic that is inside or outside a Heroku Private Space. Remember to carefully consider the overall architecture of any solution that employs a Marketing Connector, Heroku Postgres, and Salesforce Marketing Cloud instance distributed across divergent geographic locations. Network latency can become a factor in service performance. Follow these steps if you have not already created the Heroku app that you want to use with Marketing Connector. Click here to create a new Heroku app. When your new Heroku app is created, click the Resources tab from the Heroku App Dashboard. or share an existing Heroku Kafka add-on with the new Heroku app. or share your existing Heroku Postgres add-on with the new Heroku app. It’s sometimes useful to add multiple Marketing Connector add-ons to a single Heroku app. For example, if you want to synchronize data from multiple Salesforce Marketing Cloud instances, you can have multiple add-ons that are each authorized and configured to work with a different instance or data extension. Using a different Postgres database schema name or Kafka topic name for each marketing instance allows a single Heroku Postgres database or Kafka cluster to be used with multiple Marketing Connector add-ons. When using multiple Marketing Connector add-ons, it is strongly recommended to use a distinct integration user per add-on. Each Marketing Connector add-on uses a different access token for Salesforce Marketing Cloud API calls. If you use the same integration user for multiple add-ons and exceed the limit permitted by Salesforce Marketing Cloud, your connectors might fail or require re-authorization, which will repeatedly cause data synchronizations to fail. You can remove the add-on from the Heroku dashboard or with the CLI. Mapped tables will be dropped from your Postgres database when removing the add-on: you should ensure you have an up-to-date backup of your database before proceeding. If you have multiple Marketing Connector add-ons attached to your application, you also need to specify the globally unique identifier assigned to the add-on you wish to remove when using the CLI. 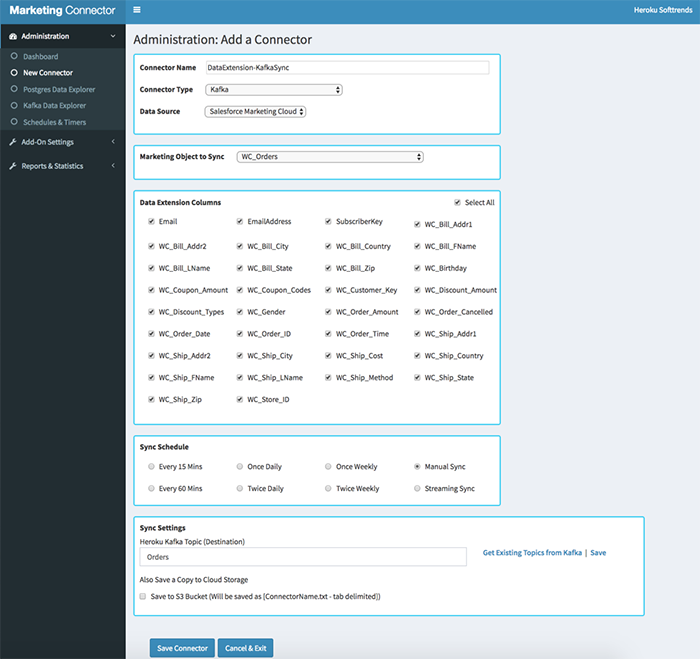 The Marketing Connector dashboard allows you to configure, monitor, and troubleshoot your data connector mappings. It is available to any member or collaborator on your application. See Collaborating with Other Developers on Your App for more information on how to manage the users who have access to your application. 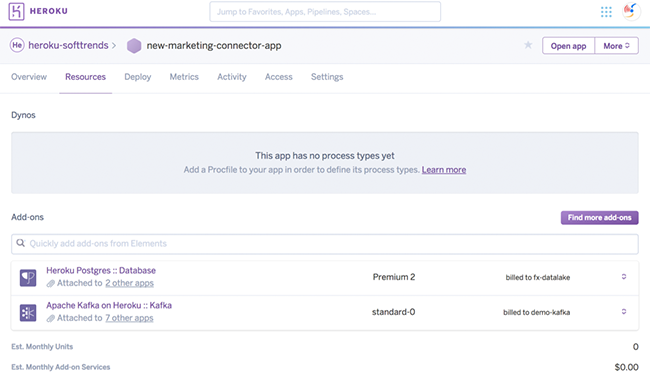 When setting up a new data connector in the add-on, you can select to sync Salesforce Marketing Cloud data from a Data Extension to either Heroku Postgres or Heroku Kafka. These steps walk you through configuring the add-on for Heroku Postgres. Click on the Add-On Settings tab, then Postgres Config to begin configuring the add-on for your destination Postgres instance. 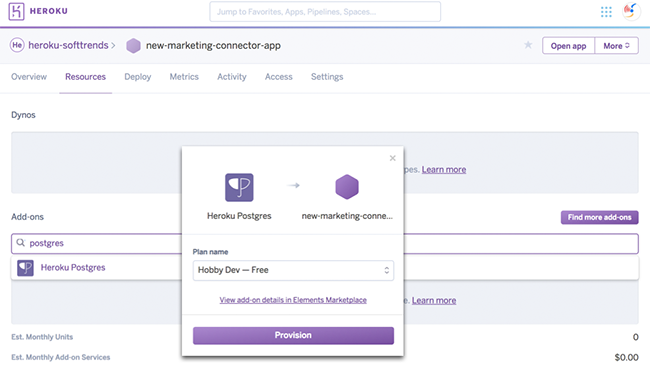 If you are using Heroku Postgres and you have provisioned it inside of your Marketing Connector add-on’s new Heroku app, you can let the add-on auto-detect your Heroku Postgres instance by clicking Get DB URL from App and then Save. Click the Add-On Settings tab, then Marketing Config to configure your Salesforce Marketing Cloud settings. Be sure to click Save next to each field as you enter each value. When setting up a new data connector in the add-on, you can select to sync Salesforce Marketing Cloud data from a Data Extension to either Heroku Postgres or Heroku Kafka. These steps walk you through configuring the add-on for Heroku Kafka, which works slightly differently from the connector for Postgres. Click on the Add-On Settings Tab, then Kafka Config to begin configuring the add-on for your destination Kafka instance. If you are using Heroku Kafka and you have provisioned it inside of your Marketing Connector add-on’s new Heroku app, you can let the add-on auto-detect your Heroku Kafka cluster by clicking Get Kafka URLs from App and then Save. Click on the Add-On Settings tab, then Marketing Config to configure your Salesforce Marketing Cloud settings. Be sure to click Save next to each field as you enter each value. 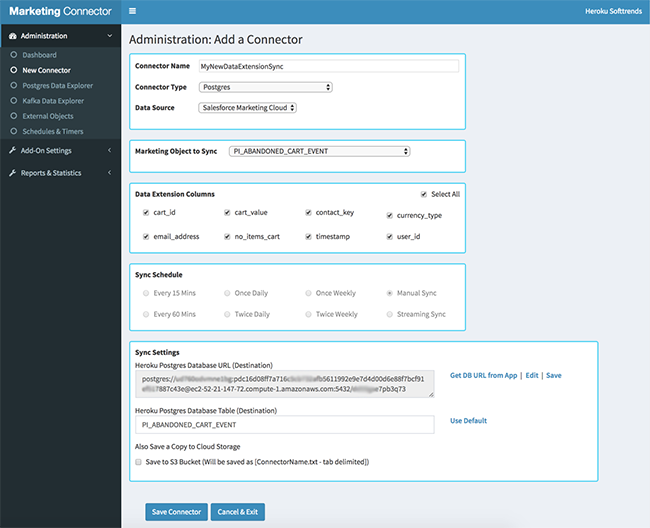 Click on the New Connector menu item and complete the configuration screen. After clicking Save Connector you will return to the Dashboard where your new Postgres Connector is displayed. Click Sync to initiate the first synchronization from your marketing data extension to Postgres. After the initial sync completes, you can Create New Connectors, View the connector you just created, or visit the Postgres Data Explorer to see the replicated data that now resides in Heroku Postgres. After clicking Save Connector, you are returned to the Dashboard where your new Kafka Connector is displayed. Click Sync to initiate the first synchronization from your marketing data extension to the Kafka Topic. 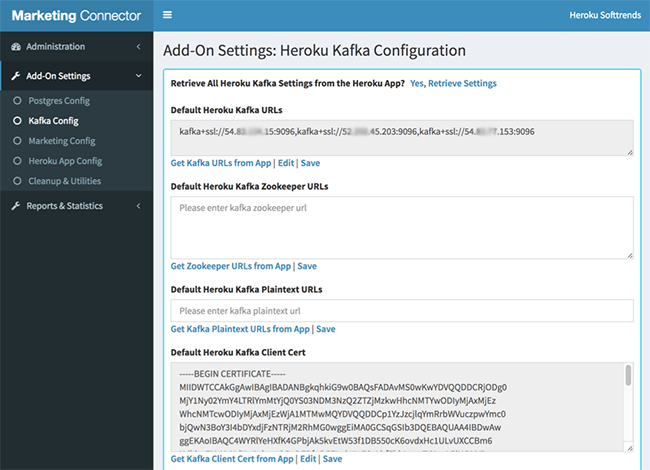 After the initial sync completes, you can now Create New Connectors, View the connector you just created, or visit the Kafka Data Explorer to see the replicated data that now resides in the Heroku Kafka Topic. Clicking on View next to your Kafka Connector will take you to the Kafka Data Explorer, where you can view the synchronized data extension Kafka Topic. All Softtrends Marketing Connector support and runtime issues should be submitted via one of the Heroku Support channels. Any non-support related issues or product feedback is welcome at heroku@softtrends.com.